Surprises are always nice. Someone apparently entered my name in a secret drawing on Terri's website, and I won! This beautiful necklace is my prize. 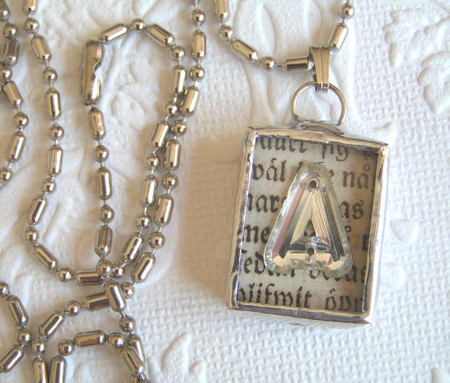 It's a soldered charm incorporating a vintage glass letter from 1930's era Germany on an antique paper background. You know I've got a thing for "A" charms and have a collection of them on a charm bracelet. I think I might keep this one on the fabulous chain though. It's a unique ball chain, don't you think? Thank you to whoever entered me in the contest! If you're interested, you can get a necklace with the initial of your choice right here. And speaking of soldering, I'm getting excited for an upcoming retreat. My friend Lisa and I are heading to Art and Soul in Hampton, VA to take a class with Sally Jean in May. I took one of Sally's classes a couple of years ago and learned how to make her amazing Vintage Vessels. I've made a few more since then. This is one of my favorites. Lisa and I can't wait for this getaway. We both have a toddler and a baby and wonderful husbands who can handle the kids for the weekend (we hope). We're heading south and, Honey, we may just keep on driving! It wouldn't be the first time. Years ago we (mostly she) drove from Ohio to southern Florida (no short jaunt) to see some guy named George.......who turned out to be my husband! Oh, the things we do for love! Lisa was the person who taught me how to solder. The girl can solder anything to anything. If you sit still long enough, she may just solder you to your chair. She's got a new etsy shop filled with all of her whimsical glass creations. There are mermaids and party hats and wands, all with an incredible amount of detail. I cannot even begin to imagine how to solder all of these mermaid components together! Here's one of her fancy party hats. Isn't it sweet? This one already sold, but there are several more to choose from. 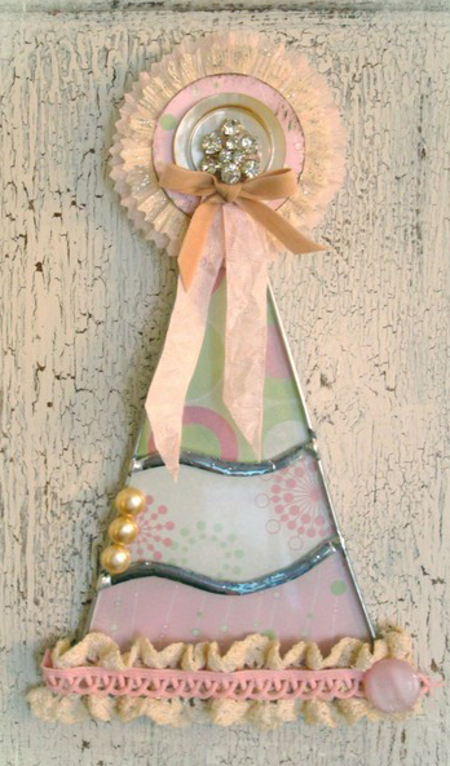 Wouldn't this be cute for a little girl's birthday gift? These hats are 2 dimensional, meant to be hung on the wall, not worn, of course. She makes it all look so effortless, but trust me, it's not! I still fumble with trying to solder jump rings onto charms every single time I do it. I finally ordered one of these "extra hands". It should make it a bit easier. Extra hands. Now wouldn't that be something. Well, I'm off to pack up some more orders and clean up the studio. Tomorrow my friend Hope is coming over to play! Yippee! And speaking of Hope......check back this week for a new surprise at One Hundred Wishes. I used to make stained glass windows and my husband still makes them sometimes. Soldering is hard to make it look smooth and neat! But it's so rewarding too. 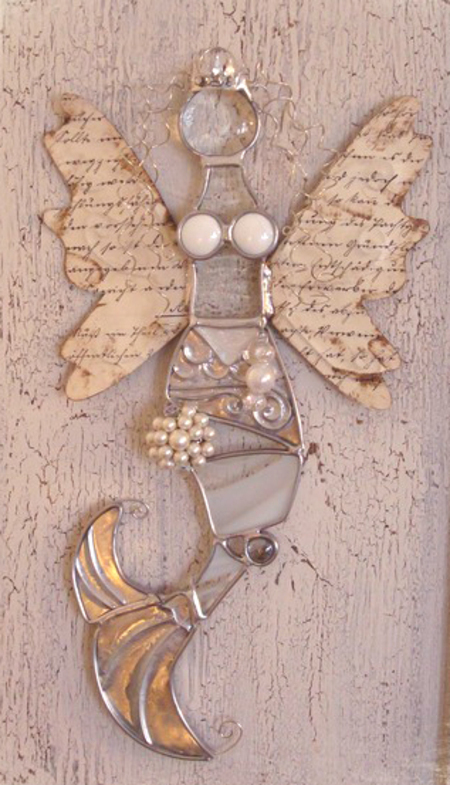 I love the charm and the mermaid, so sweet. Have fun at the retreat! Hey, I too am in one of Sally Jean's classes at Art & Soul. I'd love to meet you and your girlfriend when we are there, maybe we will be in the same class, I have Little Pink Houses with Sally. I'll e-mail you an we can compare schedules if you want. These are great. 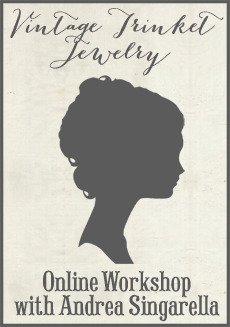 I love the way you combind the vintage jewelry also. Sounds like you are going to have an amazing time. Oh Andrea...these pieces are so lovely. Love the party hat! Sam is just the sweetest looking little boy...what a doll! 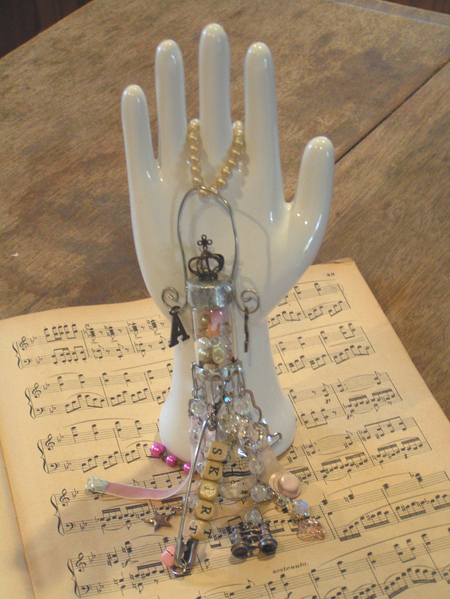 I got into two of Sally's classes in Hampton: Little Pink Houses and Bottle-icious Broach. I took one of her classes in Portland last October and really loved it. Safe travels and hope to meet you in VA! Love the mermaid and party hat. Hope you have great fun at the retreat. I found Lisa's work a few weeks ago and have already purchased 2 of her hats... including the pink one you just posted! It is hanging in my baby'r room.... sooo beautiful! Love 'em!